Slow roast cherry tomatoes with garlic cloves in an oven of 200 degrees 3 to 5 hours. I’ll toss the tomatoes and garlic in olive oil, a pinch or two of brown sugar and some balsamic vinegar. Spread them evenly on a roasting pan and place in the oven. Check occasionally, turning them over, gently, so not to burst them. I might sprinkle dried herbs at the beginning of this process, or add basil leaves at the end when I’m ready to store them in a jar and refrigerate. I add a bit more olive oil, salt and pepper when I store them in a tightly sealed mason jar. 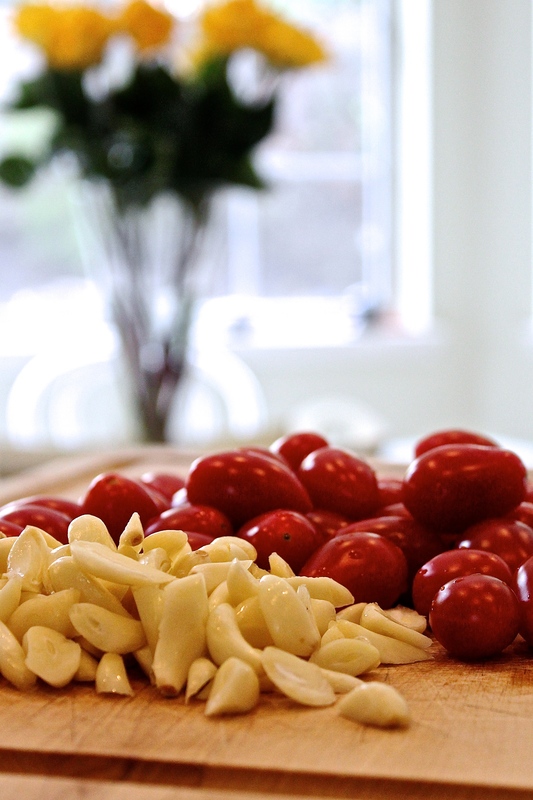 Roasted tomatoes and garlic make a great addition to a salad, or as an appetizer with fresh mozzarella. I’ve used it as a spread on toasted french bread. I once impressed a friend when I took a jar out of the fridge and tossed it in a pan of fried (diced) bacon. I tossed in cooked pasta and sprinkled on some parmesan…. she thinks I’m a gourmet cook!